William B. 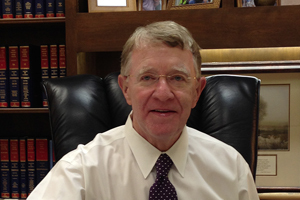 “Ike” Norment is a partner with Dorsey, Gray, Norment & Hopgood and has been associated with the firm since 1978. Ike’s practice includes criminal and domestic relations matters, wills and estates, real estate matters, and plaintiffs’ personal injury claims. Ike also has extensive litigation experience. Ike is a graduate of Henderson High School, Henderson Community College, the University of Kentucky and the University of Kentucky College of Law, where he was a member of the order of Barristers. Ike is a former District Attorney with the Kentucky Department of Highways and a former Public Defender. Though born in South Carolina, Ike’s family is from Henderson and he has lived here since childhood. Ike is married to former Betty Faye Rich of Morganfield, Kentucky. He and his wife have three adult children. Ike is a member of the Presbyterian Church of Henderson and Masonic Lodge No. 958. He is a member of the Kentucky Bar Association and a past president of the Henderson County Bar Association.